Discover yourself in a Wild Coast luxury retreat. Prana Lodge is a unique Boutique Hotel and Thai Wellness Spa situated in a pristine forest alongside the spectacular Chintsa Bay and within minutes of rolling savannah and private game viewing. Your own private haven awaits: with only 7 individually designed suites, featuring select pieces from a private collection of famous South African artists, Persian carpets, luxury linens, and oversized bathrooms with garden views promising relaxation of the first order, all completely private and secure behind your own garden walls, with patio and your own plunge pool. Prana Lodge is ideally situated for soul nurturing retreats, yet close enough to get away from major South African centres with the least of effort. An easy 40-minute drive from the East London airport, Prana Lodge offers luxury accommodation and soul’s comfort. You are invited to experience ultimate relaxation and restoration for body and soul through highly personalized and unobtrusive service, total privacy, and exceptional cuisine. 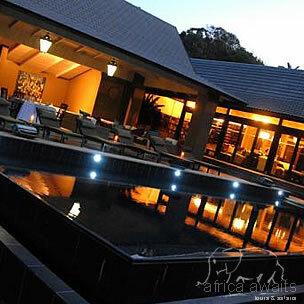 Rejuvenate your body and soul in an African Wild Coast getaway. Prana Lodge Boutique Hotel and Wellness Centre is tucked away in Chintsa East, an unspoilt coastal treasure only 40 minutes from the East London Airport on the Jikeleza Wild Coast Route of South Africa. Outdoor adventures abound: enjoy gentle or advanced hiking through indigenous bush and on wide and deserted beaches, try your hand at scuba diving, surfing, and kite-boarding, or play a round of golf at the renowned East London Golf Course, or bowls and tennis at the Chintsa Country Club. The rolling savannah of Inkwenkwezi Private Game Reserve is a 10-minute drive away and guided tours in open vehicles to see rhino, elephant, giraffe, zebra and a variety of antelope can be arranged. Chintsa area is a birdwatcher’s delight with an abundance of birdlife including sea, estuary, river and inland species. At Prana Lodge, understated luxury pampers your body, mind and spirit. Only 7 individually designed suites, featuring select pieces from a private collection of famous South African artists, Persian carpets, luxury linens, and oversized bathrooms with garden views promise relaxation of the first order. Completely private and secure behind your own garden walls, relax on your patio with your own plunge pool. Choose your suite from Turquoise, Ruby, Saphire, Emerald and the Forest suite. All suites boast air-conditioning, ceiling fans, a safe, robes, a hairdryer, a mini-bar fridge, a state-of-the-art digital telephone system, a flat screen television with satellite DSTV, a DVD player, and a CD player. Additional facilities include an outdoor pool, several cosy lounge areas for reading, relaxing or intimate conversation, a beautiful bar in the poolside lounge, and a library with books, DVD’s, music CD’s and wireless internet access. Laundry service, day tours and airport transportation are available. Young adults over the age of 16 are welcome at Prana Lodge. 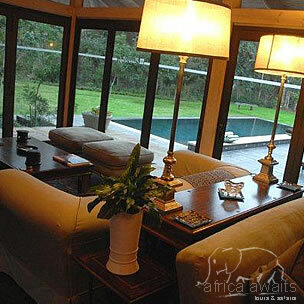 Prana Lodge can be reserved for exclusive group use. With your holiday, safari or business trip from in to Prana Lodge Boutique Hotel in Eastern Cape.